Saint Gobain’s R10400M flame retardant silicone sponge is a unique expanded silicone sheet product. It has similar mechanical properties as standard silicone sponge rubber, but with its flame resistance, R10400M holds an aggressive UL 94V-0 flame rating. Silicone is a naturally heat resistant rubber, however, without enhanced chemistry it is capable of burning in the presence of a flame. R10400M may be used similarly to standard silicone sponge products such as enclosure gaskets, soft gasket, vibration dampening, environmental gaskets, and water sealing but also for military and electronics applications that require a UL 94V-0 flame rating or flame resistance. Other properties, such as UV resistance and a wide functional temperature range, makes R10480M an ideal product for outdoor gasket and electronic enclosure gasket applications, where performance is paramount. 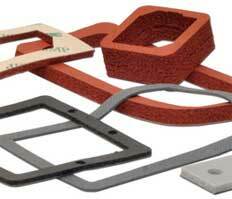 Stockwell Elastomerics offers a wide range of adhesive backings (peel and stick) for ease of installation. For more information on R10480M flame resistant silicone sponge or other UL 94 flame rated materials, please call Stockwell Elastomerics at 215-335-3005 or complete a contact form for assistance.